At the Canada Music Academy, our goal is to make music lessons fun and exhilarating for our students, while still providing a structured learning approach that's necessary to achieve tangible results and help our students realize their musical dreams. Central Ottawa, Dunrobin, Gatineau, Gloucester, Greely, Kanata, Nepean, Orleans, Ottawa East End, Ottawa South End, Ottawa West End and more. 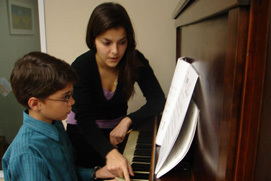 Canada Music Academy voted one of the best music schools in the GTA. Thank you! The Canada Music Academy is a proud supporter of the Fundraising for the Ottawa Children's Treatment Centre Foundation.